Challenged to ‘learn as much as they can,’ a 12-day International Association of Athletics Federations (IAAF) Level I Coaching course began on Monday and will run through Dec 22, for 16 Track and Field Coaches, who are seeking to become certified. 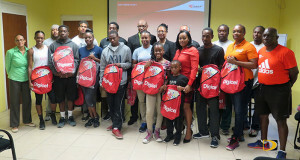 The course which is funded through an IAAF Athlete Olympic Dividend grant, was scheduled to be held earlier in the year and also over the summer but had set backs. Over the course, participants will delve into a number of areas including; coaching philosophy, growth and development, physiology, anatomy, biomechanics, skill teaching and development skills. They will also examine the IAAF Kids Athletics events as well. Besides the theoretical sessions, they will spend lots of time on the track with practical sessions, they will cover from sprints through field events, middle distance and race walking events as well as the combined events. At the end, each will have a practical assessment followed by a written exam and evaluation. Gordon said coaches like Stephen Francis and Glenn Mills of Jamaica who coaches Olympic champions Elaine Thompson, Shelly Ann Fraser-Pryce and Usain Bolt, have brought some super talent to the front. Coaches attending the course are: Akim Lewis, Tehymal Huggins, Erwin Telemaque, Burt Dorsette, Orville McMaster, Shamica Glasgow, Jennifer King, Hillary Skelton Malone, Bianca Dougan, Willis Maduro, Johnt’a Charles, Limiel Hodge, Sanya Penn, Omar Jones and Javon Carty.